Are You Ready For Harry Hype? Think you've seen a lot of hype about "Harry Potter and the Order of the Phoenix?" Just wait until the book comes out. Billboards. Baseball parks. A countdown in Times Square. The author reading on the Internet. Scholastic, Inc., the U.S. publisher of J.K. Rowling's mega-selling children's series, has planned a $3 million-$4 million marketing campaign, more than doubling its budget for the release of the last Potter book, "Harry Potter and the Goblet of Fire," in 2000. "I can't think of anything that compares to the budget for the new Harry Potter book, except for the budget for the last Potter story," says Laurie Brown, a vice president for sales at Harcourt Trade Publishers who over the past 20 years has also worked for Random House and Farrar, Straus & Giroux. Timed to the midnight June 21 release of "Order of the Phoenix," the show gets rolling on what could be called "Harry Potter Eve," Friday night June 20, with a countdown in Times Square. A billboard on Sunset Strip will announce the news in Los Angeles. "You can never take anything for granted," says Michael Jacobs, a senior vice president at Scholastic. "There's a lot of noise in the world and you have to do everything you can to get attention, especially after a three-year wait." Rowling reads from the next Harry Potter adventure at the Royal Albert Hall on June 26, and does a live interview about the book that will be broadcast simultaneously on the Internet. At the event, hosted by actor Stephen Fry, Rowling will read from "Harry Potter and the Order of the Phoenix" - which is to be published June 21 - before taking questions about junior wizard H. Potter from members of the audience and through the Internet. British Telecom is sponsoring the webcast and Microsoft is hosting the online event at www.msn.co.uk/harrypotter. Rowling's British publisher, Bloomsbury, have commissioned the companies Initial and Victoria Real, which made the "Big Brother" reality series for TV, to film the event. "There isn't a venue anywhere in the world that could host the millions of Harry fans over the world desperate to experience the magic of this event," said Tracy Blacher, MSN marketing manager. "This is what the Web should be about - taking fans to the heart of the action whether they're in Houston, Harrogate or Hong Kong." Starting in July, billboard ads will appear in Atlanta, Chicago and several other cities. Scholastic will also take its campaign to baseball parks. The publisher has reached agreements with the Seattle Mariners, Baltimore Orioles and other teams for "Harry Potter" days, featuring costume contests and scoreboard promotions. "Reaching out to kids is very important to us because they're our future season ticket holders and our future fans," says Marco Gentile, the Orioles' corporate promotions manager. The publisher already has distributed 3 million bumper stickers, 400,000 buttons, 50,000 window displays and 24,000 stand-up posters with countdown clocks. Last weekend, logos could be found on badges throughout the Los Angeles Convention Center, where BookExpo America, the publishing industry's annual gathering, was held. "You can start a game of what Muggles call `Telephone.' Start the message with Dumbledore's line from `Harry Potter and the Order of the Phoenix': 'It is time for me to tell you what I should have told you five years ago, Harry.' Then people whisper the message from person to person. Let the person at the end of the line shout out what he thinks he heard." 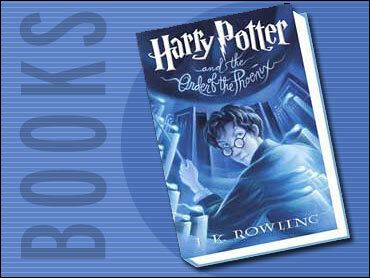 Rowling's four previous Potter novels have worldwide sales of more than 190 million and Scholastic has commissioned a record 8.5 million first printing for "Order of the Phoenix." Within hours of the announcement in January that "Order of the Phoenix" was coming out, the book topped best seller lists at Amazon.com and Barnes & Noble.com and has remained steady for months.